So, when I was in Chicago last week I visited a good friend who works as a children’s librarian and she recommended a book she’d just finished called Divergent, which is a recent Young Adult novel by Veronica Roth. I read the book while I was riding the train from Chicago to Minneapolis and drew the paper doll outfits soon after. In a slight change of pace from usual, the black and white version is posted today along with the color version. Each of the sects is defined largely by color and I didn’t think spacing out the two posts was really worth it. Plus I got both paper doll versions done at the same time, so I might as well show them off. In the distopian future of Chicago, as told by Divergent, all people belong to one of five sects. In alphabetical order- Abnegation (self-denial) wear grey, Amity (fellowship) wear red and yellow, Candor (frankness) wear black and white, Dauntless (fear-less) wear black punky style and Erudite (scholarly) wear blue. The story follows Beatrice, born into Abnegation, through her choice to join Dauntless on her sixteenth birthday and everything which comes with this decision. I enjoyed the novels engagement in questions of identity, a topic I think that is important to a young adult audience, plus Chicago was shown as a swamp which, without the various canals currently in the city, it certainly would be. And we don’t get enough novels these days that pull out esoteric words like abnegation into common speech. This isn’t a paper doll of Beatrice, since I don’t draw other people’s characters, but rather some other member of the society. I didn’t look at any of the movie promotional stuff, because I wanted to draw what I saw people in, not what the costume designer on the film saw people in. Though I did see the camera stuff around downtown Chicago where they are currently filming the movie. I also went to the Chicago City Museum’s exhibit on the Ebony Fashion Fair and you can expect to see that in paper doll format soon as well. Oh, and I haven’t read the sequel yet, so no spoilers in the comments please, though I’d love to hear that other people thought of the book. 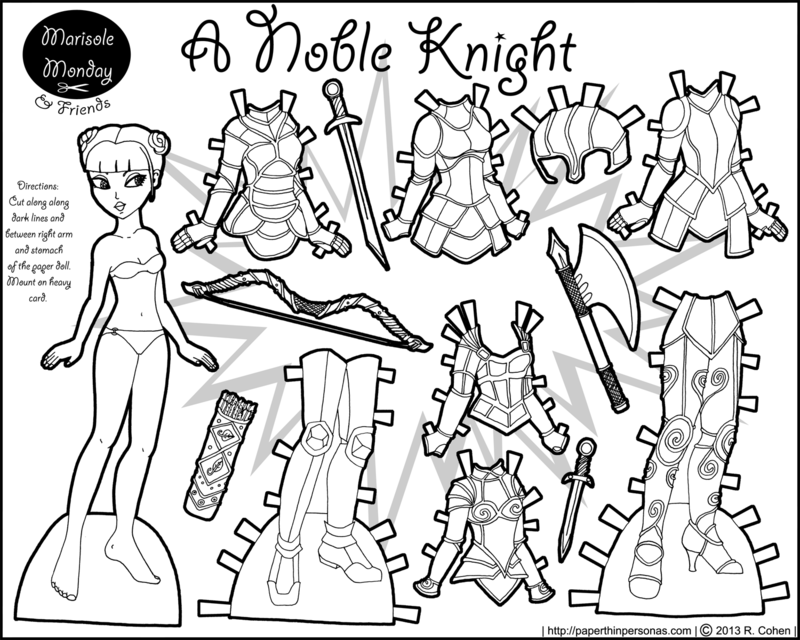 So, last week I posted today’s knight paper doll in black and white. Today, we have her in color. I’m going to be frank and say that I’m really not all that pleased with how she came out. When I was in elementary school there was a girl, who shall remain nameless, with whom I did not get along. This paper doll has very similar coloring and I find myself disliking her for that reason. Is that strange? Perhaps… I have no idea what happened to the girl in question, but I hope she is happy where ever life leads her. It is funny how things from childhood stick around so many years later. Anyway… I recently updated to the latest version of WordPress and did it without break the blog, so go me! There’s still a few things that might be a little different as I get the theme updated, but all the links and things seem to be working fine. Please be patient with me as I work out the kinks in the code. I’m not great at CSS, but I can do it with enough time and trial and error. Still, stuff might look a bit strange around here while I get it done and I apologize for that in advance. I was about six seconds from titling this “Knoble Knight”, but I fought off the urge. Be proud of me. It is both late and past my bedtime, so I am going to keep this post short and fairly sweet. I’ve done a lot of princess paper dolls, but I also like doing warrior paper dolls, so here is one. I’ve never tried to draw full armor before. I don’t know anything about full-plate armor, except that it seems awfully bulky and I wouldn’t want to wear it into battle. Actually, I wouldn’t want to wear anything into battle. I don’t really want to be in battle at all, so I guess that is a factor in all that. As I was working on this paper doll, my mind kept going back to this current internet kerfuffle over a redo of Merida the main character in Pixar’s Brave as she enters the merchandizing world of Disney Princesses. So, today’s paper doll has armor. I don’t think she’s anymore of a feminist paper doll than say last weeks princess who didn’t have a bow and arrows or sword. What is up with the current tendency to arm fairy tale princesses (like that really bad movie with Snow White and the Huntsmen…)? Women don’t need weapons to be strong and I don’t think taking away Merida’s makes her weak. And wow… this is like the most political post I have ever written. I am seriously going to bed, before I start ranting about something more pointless. So, my original idea was to make today’s paper doll a little bit latino looking with a darker skin tone than I’ve done with a Margot paper doll before, but I think she rather turned out just looking like she got a bit of a tan. So, next time I’ll rethink the color choice. Skin tones are hard, as I think I’ve mentioned many many times before. Personally, I really like the dark blue dress the best. I think it came out just like I wanted it to. 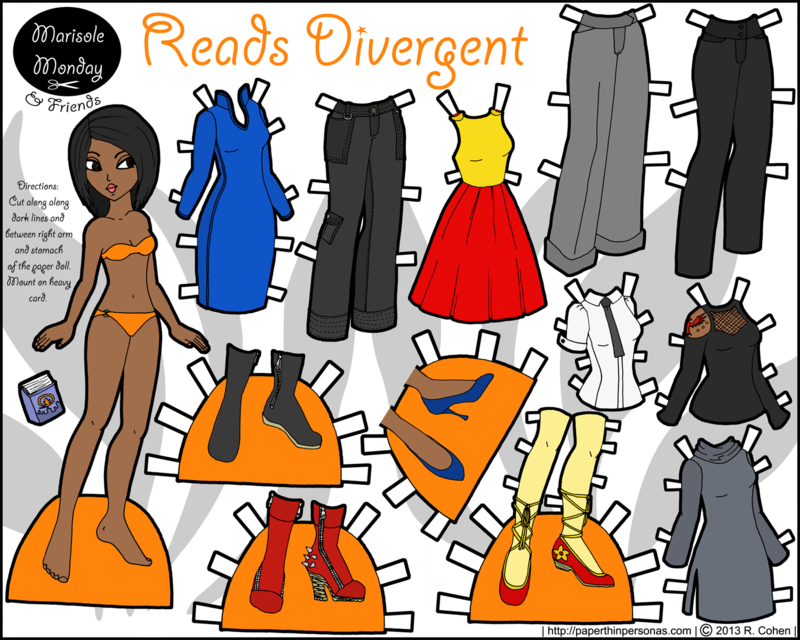 Stumbled across a new tumblr today, called Paper Doll Central. Beautiful work. Makes me wish I still was trying to keep up with my tumblr. Lots of nice paper dolls there worth checking out if you have a few minutes and want to indulge. 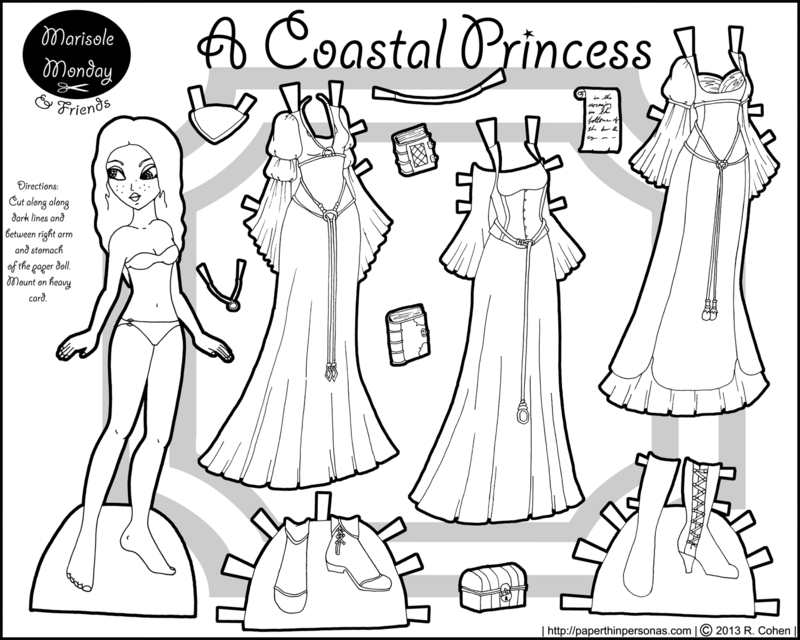 I mentioned last week I was inspired by the Mediterranean ocean when I colored this paper doll. I was also inspired by the idea of not using any pinks or reds, just clean clear cool colors. I imagine Margot walking on the beach, wind whipping through her skirts while she watches ships on the ocean. Then, possibly, being attacked by giant crabmen from the planet Neptune. Maybe I should have drawn her a sword. Today, we have Margot rocking a fantasy look. I know the title seems of today’s paper doll seems a little odd. There’s nothing obviously seafaring about this paper doll, but I already knew that I wanted an ocean color scheme for her before I posted today’s Margot. On Saturday, I went to my favorite game shop to pick up some new dice and met a nice art student with whom I chatted for a while. He spoke so vividly about the colors of the entertainment sea that I knew I wanted to use them in my next paper doll set. You’ll have to wait to next week to see her colored, but I think she’s going to look wonderful. Spring has come to Alabama and with it pollen. I never used to have allergies and now I am sniffling and sneezing up a storm. No one warned me about this problem when I moved here… It’s beautiful. The trees are blooming. The birds are singing. And I have forgotten what it feels like to have both nostrils working. People keep saying it will be over soon, but I wonder what “soon” actually means. Back on the paper doll front, I always have trouble coming up with accessory items for the paper dolls. Does anyone have ideas for medieval fantasy-ish sets like this one? I seem to draw a lot of books and boxes and scrolls and swords. I suppose more jewelry would be an option… I need to think on it. 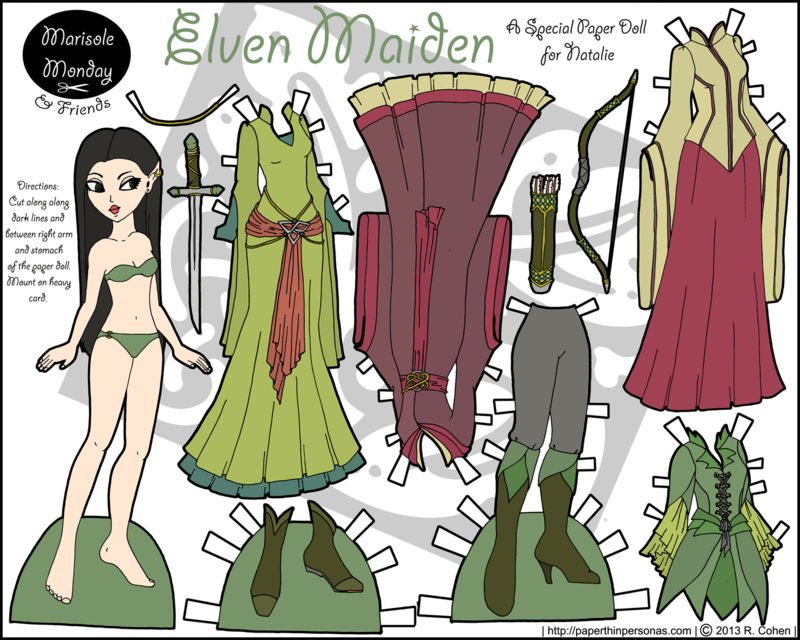 Though this might be the last fantasy paper doll set for a while. I’m feeling a little restless with the style. So, a while ago I had a contest to name the Mini Maidens. Natalie won my contest and therefore won her very own custom paper doll. Natalie selected a Marisole Monday & Friends paper doll as the basis for her paper doll, specifically Marisole. I would love to have an Elf themed sort of thing like in the Lord of the Rings (with marisole)… Also can you make sure she has a bow and arrows? (that would be awesome!)…. I’m sort of imagining her with a little medievial themed clothing. So I openly confess that the last time I read Lord of the Rings I was thirteen, stuck in Italy and only got through it due to the lack of other English language reading material. I’m not much of a Tolkien fan, truth be told. Never the less, I liked the movies (not enough to own them, just enough to not mind watching them with others) and I do think Tolkien was the father of modern epic fantasy. Not being a huge epic fantasy reader, the jury is out as to whether or not this was good thing. Needless to say, I wanted to try to capture the spirit of the LOtR elves from the movie to the best of my ability without actually copying anything from the films. The Costumer’s Guide to Movie Costumes was a godsend in this regard, proving me with a wealth of photos of elven costumes to pull from. The kimono sleeves are my addition, because I love kimono sleeves and the modified mandarin collars give everything a tiny bit of Asian flair. Normally, I don’t post both the black and white and the color versions at the same time and I won’t be doing this again, but I didn’t want to make Natalie wait for the color version of her paper doll set. Both are here for printing, so people can select their choice. I did a sort of autumn theme for the colors. Natalie didn’t give me any guidance on the color scheme, since she said she wanted to be surprised. So, did I capture the spirit of Lord of the Rings or totally fall flat? Let me know in a comment, since I’m not going to be picking up those books again if I can help it. So, as I mentioned last time, I always liked the idea of multiple costumes for various activities that was such a part of the Victorian way of dressing. Personally, I think it would be rather fun to have a special outfit I wore while visiting or yachting, but jeans and a t-shirt seem to see me through nearly all of my social engagements. I suppose that says something, perhaps not flattering, about the nature of my social engagements. The outfits today, are, as I mentioned last week, a grey and teal skirt which can be paired with either the corset, jacket, and top hat to make a traveling or promenade suit or can be worn with the bodice trimmed in pleats for a dinner toilette. The yellow and white yachting costume is sort of practical (barely) and the bathing dress (a swimsuit to most of us) has matching slippers. All things considered I think Mia would do quite well for herself with this set on vacation. Of course, she can share her dresses with Marisole and Margot. Personally, I just got back from gallivanting around Alabama for work and then finishing up my taxes (I hate doing taxes) and now I can consider all of my obligations for filled for the moment. 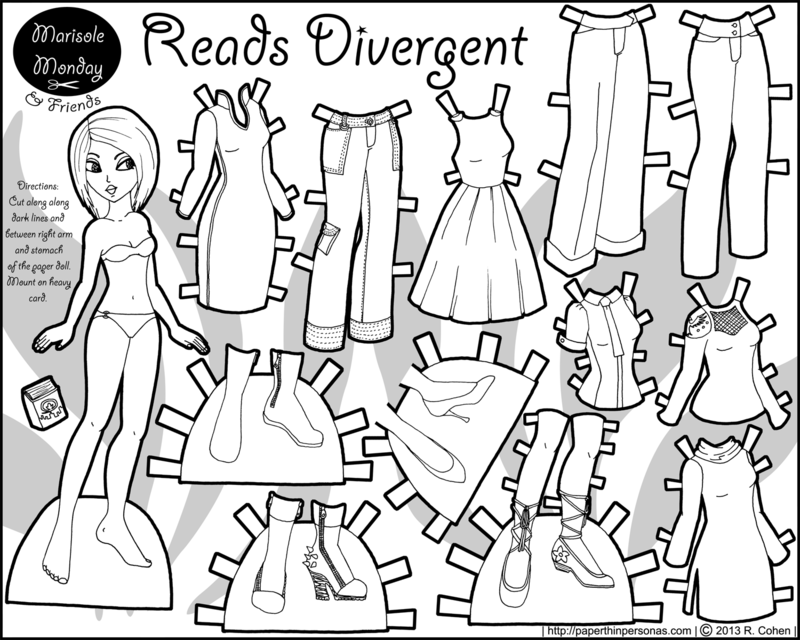 As always, enjoy the paper doll and, as always, feel free to let me know what you think. Next week, there will be elves.